No particular plans for these two little suckers, just put them in stock for next time I need a security camera. Perhaps if I ever find the need I will set them up with a computer and a video capture card and a huge hard drive for some monitoring of my place. Two of these LED lightstrips. They are 5 meters long with 27 segments of 6 LEDs each. They came with the little box you can see in the top right hand corner, its designed to recieve a signal from an IR remote control to control the pattern, but neither of them came with the remote. Anyway, I googled around for a while and found that I could simply control them with my arduino using Adafruit's awesome NeoPixel library. There is my ugly hacked together setup to see if it actually worked. Which it did :) here is a video of both of them running, the one in the spool is the stock demo mode that it defualts to when its on, and the unrolled one is the one being run by the arduino. The only thing to note is that on the spooled one, there appears to be a connection break about half way thru, but if you flex it a certain way, it still works as is evident in the video. Because of the way you can chain these things its no big deal, Ill just cut that one segment out and resolder them back together, or use them as smaller strips. I plan on adding these to The Window for a nice light show as well as orientation, as suggested by Duane Degn on The Window's Letsmakerobots page. A couple of posts back I mentioned I have trouble sticking with one project, and its true. I really do. Anyway, I picked this bad boy up to help totally revamp Project Killzone. Pretty much ever since I picked up the two motors that are in PK now I have wished to have two more so that I could make a nice sturdy 4 wheel drive chassis instead of the 2 wheel drive one I have now. Anyway, the oppertuinity came along finally to get two more at a resonable price and also, I think (think, have not tested this yet) I can use all four wheels that came with the car, cause they don't appear to need the adapter couplings that the other wheels needed. As you can see, it uses identical wheels on the front and back, excellent for me :) and if the motors are the same then I should be able to just slip the new wheels onto the old motors. If that works, PK will end up looking signifigantly different. The best part of this all? All of the above was purchased for a grand total of 25 US dollars. Not too freaking shabby considering that is the price for ONE meter of LED strip from sparkfun.com and if you want 5 meters? $120. Granted, they have more LEDs and each individual one is addresable, not every 6, but still. Quite the deal I'd say. Well thats really all for now, once I get something done on my projects, ill post the proof :) Happy Hacking! So I have been working on Raven recently. You know this. But it is December, in Canada. And you know, its hard to test a UGV when there is two feet of snow on the ground. However, I do have a UAV that I have not worked on much since the last post about it. In fact I haven't so much as changed one thing until last night. So I figured it would be good to give it some love too. If you read my previous posts on the window, you know that my entire purpose of building an octocopter with huge payload capacity was to eventually mount a paintball gun onto it. Heh. I have begun that task. First up was stripping off that pan/tilt camera system. For nemourous reasons, I now have a gopro instead of my cheap ATC mini, the video was blocky due to 2.4 GHz radio interference from the windows TX, the system was not the greatest anyway. And I need that space for my gun mount. So anyway, besides the gun, in the meantime I picked up one of those wireless back up cameras for your car really cheap. It may or may not cause and pick up interference like the old system did, but I gotta try it out. I'll be giving that a try for my FPV, along with a gopro to record the antics. Armament wise, I am again using my POS spyder victor, cause, you know, I'm too cheap to get a better gun, and this one works, kinda... Anyway, couple 1/2" PVC tees, zip ties, and hose clamps later and I've got a decent gun mount. I'll be mounting the air/CO2 bottle in a similar way. At the moment, I have only gotten so far as a mock up, but this is something like what it will look like. The mounting tees need to be modified a bit, the bottle will be slung below the copter too, and I need to mount the trigger servo yet still, but that's a decent idea of what it should look like, minus legs. Anyway that's all I got for now, but I'll update as I get more progress. Heh. Weaponized drones. 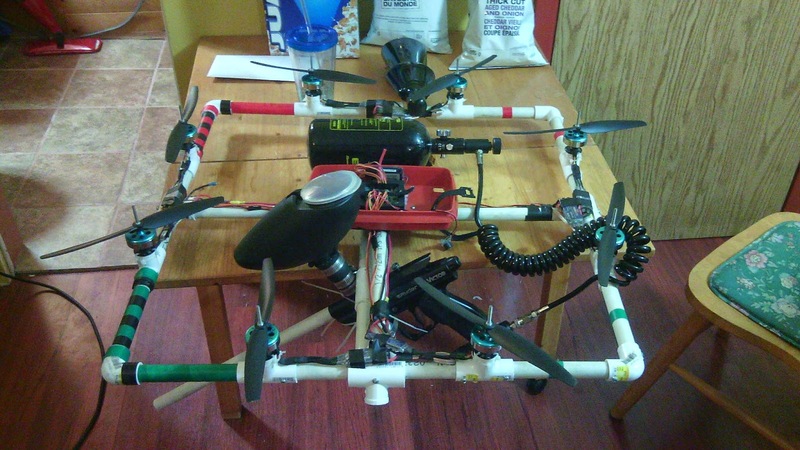 Homemade weaponized drones. How I love hardware hacking. Have a wonderful day folks, and if you follow in my footsteps, be safe and never point this at any living thing or property not your own.